Slowly but surely, or rather, cyclically, my breakfast planning is improving. Despite my love of breakfast foods, working from home, without any mandate to arrive for work at a specific time looking a specific way, leads to breakfast decision fatigue, complicating what could be a simple and healthy start to the day. Kind of like that sentence could be one of the longest and most confusing, but I think still grammatically correct, I’ve ever written. Lately, though, in spurts, I manage to portion out a few days of overnight oats, so that I just have to add almond milk for a super productive next morning. 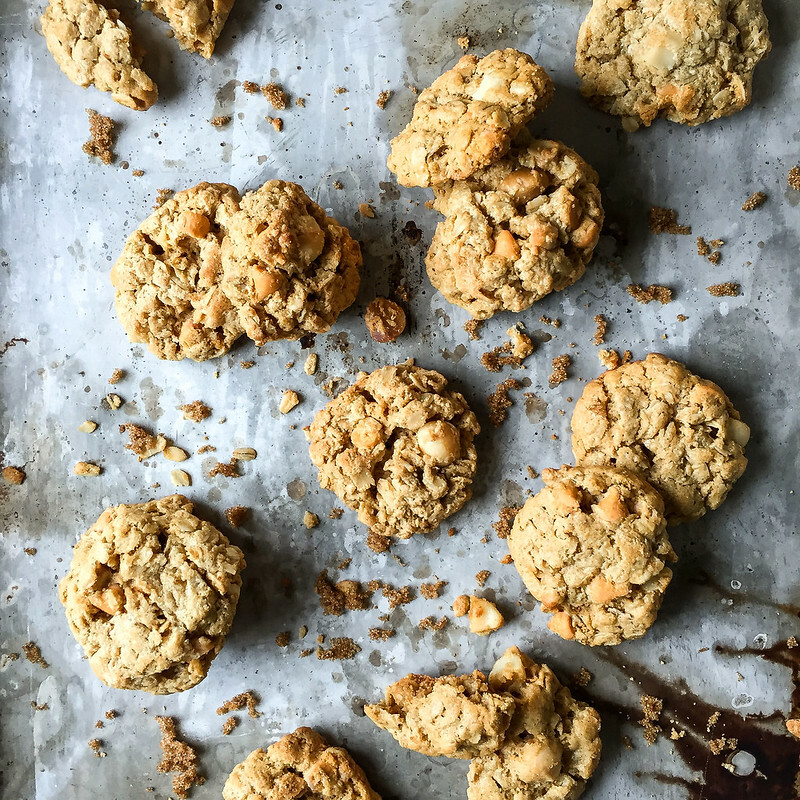 It was on one of these prep nights that my eyes wandered to the back of a fresh bag of Trader Joe’s gluten free oats, to a recipe for–could it be?–an actually cohesive, chewy, and gluten free chocolate chip cookie. I had to find out, so I set my butter out to room temperature and, a few days later, hours before our flight to Minnesota took off, cranked out four dozen cookies, refining the pleasantly generalized recipe to make it a little more friendly to the non-baker, which includes my current self. Purusing my pantry, I also saw the opportunity for a nostalgic mix-in combo. You remember the white chocolate macadamia cookies from Subway, right? They never failed to lure me in, putting a kink in whatever health kick I was on at the time, particularly in college when fast, familiar food was a staple. Something about them is so addictive, and with a new sense of adventure at the grocery store, I now know that “something” to be the sweet, toasty macadamia nuts themselves. I’ve been slowly working my way through a leftover pint of macadamias (after making Molly’s stellar marzipan balls), and this was the perfect opportunity to finish them off completely, emulating Subway’s genius, timeless cookie combo. As you’re probably well aware, if the gluten free factor is what brought you to this cookie recipe, the real test of any gluten free cookie is how well it holds together. 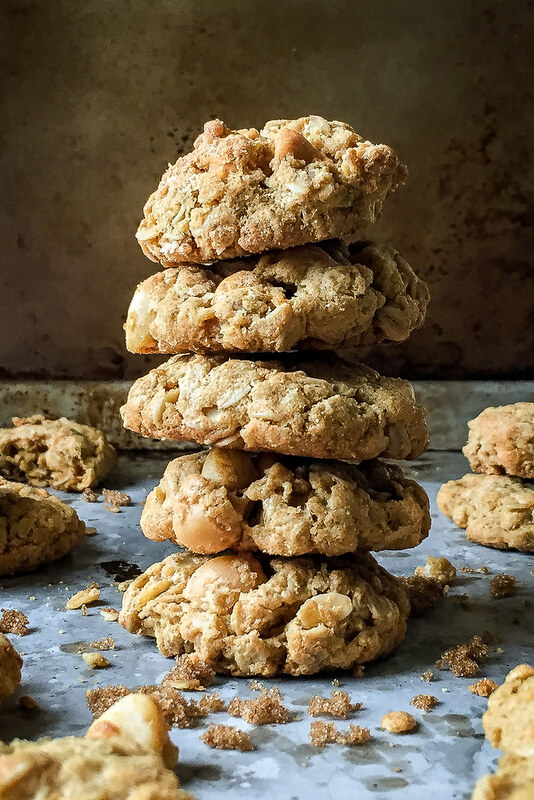 I don’t care how many or how few ingredients a cookie has: if it crumbles at the first bite, regardless of flavor, it’s banished forever from my Pinterest boards. So, of course, I was impressed that, without much fuss around baking times and cookie size, these little clusters have a bit of crunchy bite on the outside, are perfectly chewy on the inside, and just proved that they’re sturdy enough to survive in an airplane carry-on, packaged only in a zip top plastic bag. I think those criteria are sufficient to elevate these to the status of miracle gluten free cookies, worthy of a blog post on a food blog dedicated almost entirely to savory comfort food dinners. Between snacking on the remains of these cookies at my parents’ Minnesota condo, we have a lot planned for this whirlwind (as usual) trip. The reason for the trip is the Synergy Series dinner at chef Gavin Kaysen’s Spoon and Stable. I have my amazing husband to thank for chef’s table tickets (O. M. G.), and there’s sure to be morning-after Instagram coverage. We’re also going to hit Broder’s Pasta Bar, on our list forever, a couple favorite pizza spots, church with my parents, Duluth for a day trip and some hiking (and pie), and respective girl/guy dates with my parents: the boys heading to a baseball game and my mom and I relaxing after I pick her up at the airport, where she’ll land after a week-long work trip to Orlando (impeccably timed). Wish us luck! Also, for more of the real life, unstyled pics, I’m attempting to keep a separate Instagram account. Find it here and follow if you like, for pics to go with so many of the stories I share here on the blog. 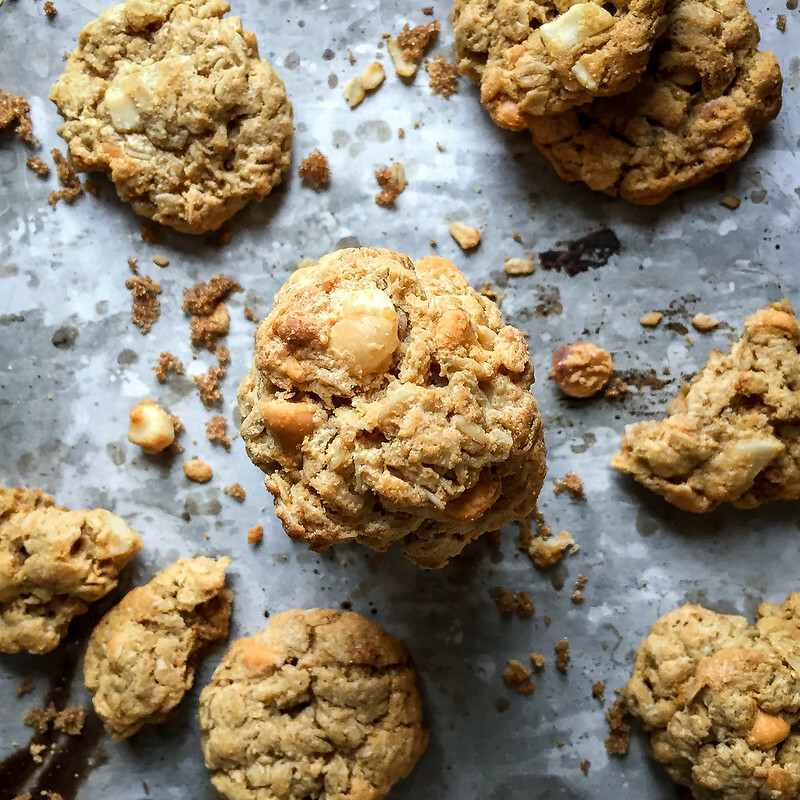 If you like Subway's white chocolate macadamia cookies, you'll LOVE these chewy, gluten free macadamia butterscotch clusters. Beat the butter and both sugars with a hand mixer or in a stand mixer until well combined. The mixture may look crumbly but should stick together when pressed with a spoon. Beat in eggs and vanilla, then add baking soda and salt (if using) and beat until combined. Finally, mix in peanut butter on medium high speed until well mixed. Stir in chips, nuts, and oats by hand and refrigerate the mixture at least 30 minutes, or up to 12 hours (or longer, but I prefer to play it safe when raw eggs are involved). Use a regular spoon to scoop 1 to 2 tablespoons of chilled dough and press each into a packed ball. Place a dozen at a time on a parchment lined cookie sheet, then flatten slightly with the palm of your hand. Bake until just golden on the bottom and edges, about 11 minutes, keeping remaining dough refrigerated in the meantime. Cool on sheets about 5 minutes before removing to a wire rack. 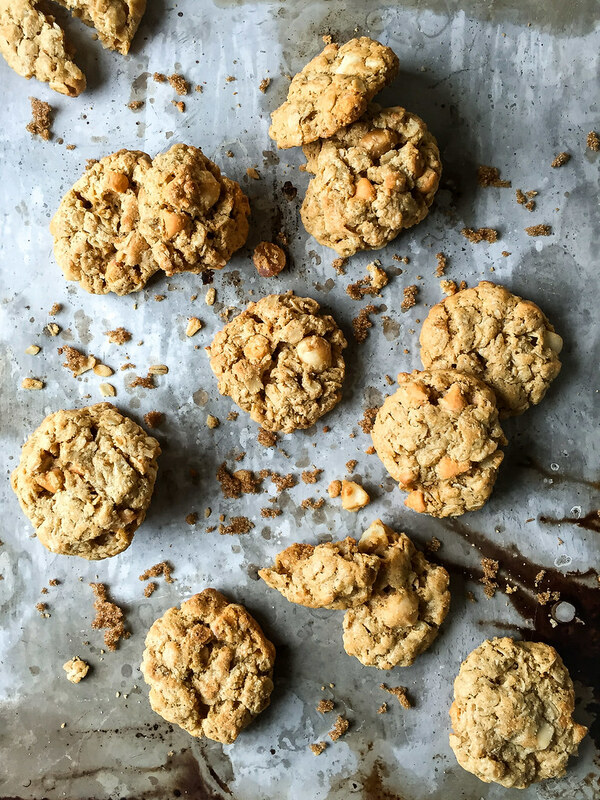 The cookies are best at room temperature--chewy without crumbling into pieces. Repeat with remaining cookie dough. The cookies keep well for a few days when stored in an air tight container. It helps to keep a bowl of water nearby and handle the dough with damp hands--it will help to keep it from sticking. To really up the macadamia flavor, you could replace some or all of the peanut butter with homemade macadamia nut butter--run macadamia nuts and a pinch of salt through the food processor for several minutes, until you achieve peanut butter consistency. Note: This page contains affiliate links. It does NOT contain sponsored content. 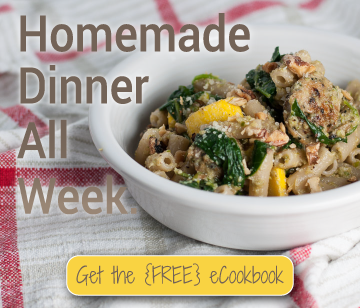 Affiliate links (to products I recommend, on Amazon) offset my ingredient and website maintenance costs, so I can keep bringing you sweet recipes like this one. Thanks!